Starting from March this year, travellers will be able to enjoy a trip to Jeju Island at massively reduced prices as several of the major hotels on the resort island are offering discounts on food and accommodation. Jeju KAL Hotel, in ido-dong, Jeju City, is offering a "sweet honeymoon package" for the month of March. A variety of discount prices for ocean-view luxury suites, a 25 percent discount on Korean Air flights to Jeju, a free breakfast meal for two people, a cosmetics gift set, and a bottle of wine plus two free passes for the hotel's fitness center are included in the package. Prices for the package are 220,000 won for weekdays and 320,000 won for weekends, breakfast is included. For details or reservations call 02-310-6677. 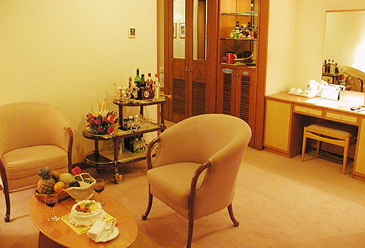 Ramada Plaza Jeju Hotel's package is available from March 1 to the end of March, 2006. The package room prices are 215,000 won for weekdays Monday through Thursday and 255,000 won for weekends from Friday through Sunday and all public holidays. free of charge. For details or reservations call 064-729-8222-4. Lotte Jeju Hotel in Seakdal-dong, Seogwipo City, starting from March 1 this year, will offer discount prices for fitness club members and Jeju residents. It will also introduce new six-month membership cards for 700,000 won. Accordingly, the 150,000 won monthly membership fee will be reduced to 120,000 won, and the yearly membership fee of 1.5 million won will be reduced to 1.2 million won. Fo Jeju residents only the daily price for the fitness center will be decreased from 16,000 won to 10,000 won. The fitness center includes a swimming pool and a health club. For details or reservations call the Lotte Jeju Hotel's fitness center on 064-731-4280-1. Crowne Plaza Hotel & Casino Jeju in Yun-dong, Jeju City, will invite guests to its buffet restaurant Cafe Baccarat with reduced meal prices. For the coming month of March, the cafe will offer a lunch buffet at a meager 15,000 won and a dinner buffet at 19,000 won, respectively. Regular prices for lunch and dinner are 24,000 won and 32,000 won respectively. Two free buffet lunch prizes and prizes for free cakes will be drawn for some lucky guests, and for all those guests over 18 you can expect to be furnished with a free draft beer as well. Other prizes to be drawn include a Zipel refridgerator, free hotel accommodation and free meals at this luxurious hotel. Miss Sarah Song works as staff reporter for The Seoul Times. She covers travel and hotel areas. Sarah majored in journalism at Sungkonghoe University. During her school days she served as a volunteer reporter for newspapers and magazines. Her hobbies are watching movies and reading murder-misteries.